Sat., March 17, 2001, 8:24 a.m.
MEMPHIS, Tenn. – Gonzaga University players and fans had seen it before. Two years ago, remember? The replay that never ceased. Casey Calvary. Game-winning putback. NCAA tournament hysteria. Gonzaga won. Florida lost. The basketball world gasped. Then the basketball world cheered. They saw it again Friday. Heck, by the time the day was over almost everybody had. Calvary. Game-winning putback. More tourney hysteria. Gonzaga wins. Virginia loses. Only this time, everybody sighed with relief. Then they cheered. That’s because this time, Gonzaga, despite being the No.12 seed, was a popular choice to beat No. 5 Virginia. The Bulldogs did just that, 86-85 in the first round of the South Regional at the Pyramid. Gonzaga will play No. 13 Indiana State, a 70-68 overtime winner over No. 4 Oklahoma, at 11:15 a.m. Pacific time Sunday. “Thank you,” GU point guard Dan Dickau told Calvary after the game was over. The thanks was for saving the game and the season. 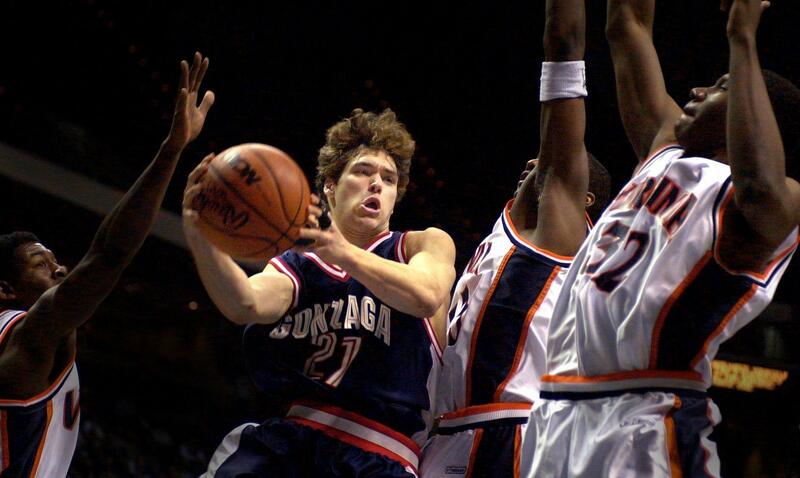 Gonzaga had let this game slip away. Up five points, 82-77 with 3:41 left, the Bulldogs were down one, 85-84 with 21.4 seconds left. That’s when Calvary told Dickau to take it straight down the lane. “He was going to dish or put up the shot,” Calvary said. Dickau went the distance, drove into the lane and put up the shot. Virginia’s Adam Hall blocked it. Calvary grabbed it. He pumped. And with 9 seconds left, he put the ball in. “Bodies were flying around as the shot went up, and the ball just kind of fell in my hands and I put it in,” said Calvary. “When Dan makes that move, both Casey and I loop around back up to follow him down the lane,” said GU sophomore forward Zach Gourde. “Then we can get a feel for where the ball is coming out of his hands. But now the Bulldogs had to play defense. Gonzaga did move its feet. But, just like the rest of the day, it had trouble keeping the quicker Cavaliers in front of them. Roger Mason got the inbounds pass, went the distance, got close to the rim and missed the shot. Calvary grabbed the rebound. Naturally. It was, after all, his 15th of the game. It went enough. Mason led Virginia back, again and again. The Cavaliers appeared to be down and out several times. They overcame deficits of eight, eight and 13 points to tie or lead. Mason, who had a game-high 30 points, and Keith Friel, who three 3-pointers in the second half, led all three charges. They also were aided by Calvary and Gourde going 1 of 9 from the free-throw line, including 0 for 4 in the last 5:11. But Virginia never was able to get separation from Gonzaga. Not against a team is among the five teams in the country to go to the last two Sweet 16s. Especially when you are a club that hasn’t even been in the tournament since 1997 or won a tourney game since 1995. So, while Virginia was scrambling to catch up, Gonzaga stayed calm and stayed committed to what has earned it six NCAA tournament victories in three years. In the first half, it looked as if Calvary had forgotten to get up - out of bed that is. The senior forward had four turnovers, was 1-of-4 shooting and allowed Virginia to control the baseline for easy backside buckets. Dickau, on the other hand, was putting everything in the hole. The junior point guard scored 21 of his 29 in the first half. He shot 60 percent from the floor. He was 4 of 5 from behind the arc. In the second half, Virginia, even without foul-plagued point guard Donald Hand, figured out how to stop Dickau. “They denied me the ball,” he said. But the Cavaliers forgot to deny the post and block out. Calvary got inside and on the boards. Seven of his 15 rebounds came on the offensive glass. Two produced dunks, the second of which was a spectacular, airborne, one-hand grab and dunk. That dunk put Gonzaga up by 13 points, 66-53 with 11:32 to go. Friel and Mason rallied Virginia to set up the finish. Published: March 17, 2001, 8:24 a.m.